Koji Yuki was 20 years old when he turned against his father and buried his Ainu identity. That was the year Shoji Yuki died; a radical activist, he had long fought to win legal rights for the Ainu, Japan's underclass, and have them recognized as an indigenous people. More than a century of government-backed racial and social discrimination and forced assimilation had stripped the once-proud hunter-gatherers and tradesmen of their identity and livelihood. Singer Mina Sakai performs new works in the Ainu language (as well as in Japanese and English), accompanying herself on an amplified tonkori. The Ainu people's only stringed instrument, it was used originally by shamans to communicate with the kamuy, or spirits in nature. The Ainu cause had torn apart the Yuki family. "My father divorced my mother when I was young and devoted himself to the Ainu liberation movement," says Mr. Yuki. "I couldn't understand the way he lived his life." Years later, Mr. Yuki changed his mind about his father's efforts, and today the son is himself a powerful voice for the Ainu. But he speaks through culture rather than politics, as one of the leaders of a remarkable revival of Ainu arts, dance and music -- with a cool, contemporary edge. The origins of the Ainu are still debated. The most popular theory is that they are descendants of the Jomon people who lived throughout Japan 13,000 years ago. They are considered a race different from the "mainland" Japanese, who are called "Wajin" in the Ainu language. The Ainu eventually settled in Japan's north, and for centuries their villages dotted Sakhalin Island and the Kuril Islands. (These were seized by the Soviet Union at the end of World War II, though Japan has disputed the claim for four of the Kuril Islands.) The Ainu culture fell victim to Japanese expansion in the 1800s, and most Ainu now live in Hokkaido, the second-largest of Japan's four main islands. In 2006 the Hokkaido government put the number of people of Ainu ancestry there at about 24,000; the national census doesn't include such a count, but after generations of intermarriage the total is far larger. Many hide their Ainu identity, still fearful of discrimination. Handsome with a powerful gait, Mr. Yuki, 45, reveals a shyness as he explains his work as a hanga (wood block print) artist. "Hanga is not part of the Ainu traditional arts, but woodcarving is," he says. "So I asked my favorite Japanese hanga artists to teach me. I might be the only Ainu doing this professionally." His prints are mainly of animals native to his Hokkaido homeland, such as the deer, fox, bear, owl and magnificent red-crowned crane. The island, known for its severe snowy winters (it's a popular ski destination), is the site of breathtaking mountain ranges, volcanoes, lush forests and crystal lakes, and unique flora and fauna. It's easy to understand the Ainu reverence for nature and the animistic belief in spirits. "My prints are based on traditional Ainu legends, mainly animal spirits," says Mr. Yuki at a one-man exhibition in Tokyo. "The bear is especially important." Among the Ainu, the bear is considered the most sacred of animals; one of the works in the exhibition is "Hepere Cinita," or Dream of the Baby Bear. (All the works in the exhibition carry titles in the Ainu language.) His "Sarorun Kamuy," or Crane God, he says, "represents the Ainu's desire to return to their roots, like the great cranes that migrate back to Hokkaido every winter." He created the work in 2008, after the Ainu won official indigenous status from the Japanese government. That followed the U.N. General Assembly's passage in 2007 of the Declaration on the Rights of Indigenous Peoples, and came just before a 2008 Group of Eight wealthy nations summit in Hokkaido. Mr. Yuki the hanga artist and carver is also a musician, founder and leader of the Ainu Arts Project, a decade-old community-based music group. "We're a native rock band based on traditional Ainu music," says Mr. Yuki, explaining that he was inspired by the aboriginal Australian band Yothu Yindi and Native American bands. The 25 members, from kids to seniors, perform 50 to 60 times a year. They sing mainly in the Ainu language and dress in the splendid Ainu attusi robe. Along with the guitar, drums and bass, they play the Ainu tonkori (like a zither) and mukkuri (similar to a jew's harp). "We've chosen a rock sound because we don't want people to associate the Ainu with just old tradition," Mr. Yuki explained. "With hanga, music and singing I can convey the traditional Ainu culture and spirit with new expressions, just like Oki and Mina Sakai." Mina Sakai is a 27-year-old musician who founded the Ainu Rebels hip-hop group; Oki is Oki Kanno, the dynamic, 50-something leader of the Oki Dub Ainu Band, and probably the Ainu's biggest star. Half-Ainu and half-Japanese (as is Ms. Sakai), Mr. Kanno has taken the band on tours of the U.S., Australia, South America, Europe and Africa, and collaborated with numerous indigenous artists, including the well-known Native American flutist R. Carlos Nakai and the Australian aboriginal band Waak Waak Jungi. The band's sound is a hot, rhythmic fusion of reggae (hence the "dub," a reggae genre), African music and electronica highlighted with traditional mukkuri and amplified tonkori. "I'm called the 'Tonkori Man,'" Mr. Kanno says after a recent Tokyo gig where the packed house, including fans from Brazil, jumped and jived throughout the three-hour nonstop performance. It was a tonkori that Mr. Kanno received as a gift in 1992 that persuaded him to pursue music. He had just returned to Japan after five years working in film production in New York City. Fluent in English (and its expletives), Mr. Kanno says he has no formal musical training. "But I've got my ancestors backing me, which makes my music strong," he adds. "My ancestors were really great. They created powerful rhythms and melodies, inspired by the different cultures they came in contact with through trading." Unfretted, with three to five strings and a long, thin, wooden body, the tonkori is the Ainu people's only stringed instrument. With its limited pitch, it calls on the player to create rhythmic variations rather than melodies. Mr. Kanno spent 15 years getting his amplified version finely tuned; now he has a powerful, original sound that isn't drowned out by the bass and drums. Mr. Kanno is clear about his goal: "What I want to do is create a really cool Ainu groove, a new type of music." A major impetus for the cultural revival was the Law for the Promotion of Ainu Culture, enacted in 1997 (a major turnaround from laws of the mid-1800s that cemented bans on the language and customs.) It led to the establishment of government-backed institutions such as the Ainu Culture Center in Tokyo, which opened that year. Ms. Sakai, with a smile that lights up a room, has become an inspiration for young Ainu. Her own inspiration was a visit with Haida Indians in Canada during a high-school class trip. She loved their new songs -- cool, positive and energetic. After years of facing discrimination in her Hokkaido hometown, she suddenly took pride in her Ainu heritage. Ms. Sakai and her brother, Atsushi, started the Ainu Rebels in 2006 as a way to dig into their Ainu roots. The group wore attusi robes and Ainu headwear and incorporated Ainu ritual dances like the crane dance for women and the sword dance for men. Lyrics were sung in the Ainu language -- with a fresh hip-hop take. Among older Ainu, reactions to the Rebels was mixed. "Because it was so new, some conservative elders didn't really like the idea, but others were happy about it," says Atsushi Sakai. The Tokyo-based group grew to eight members, all of Ainu descent, and was spotlighted as a case of empowered Ainu youth reviving and recreating Ainu tradition. Ms. Sakai balanced her music with activism. In July 2008, just ahead of the G8 summit, she helped organize an event in Hokkaido that attracted indigenous peoples from around the world. The festival mixed traditional culture with calls for Ainu rights, including a formal apology from government leaders for past wrongs. Caught between old and new worlds, Ms. Sakai is struggling to find her place as an artist. "It's important that I spread Ainu culture and create pride among the Ainu, so there is no more prejudice or discrimination against us," she explains. "But this means I am not totally free as an artist." The Ainu Rebels disbanded last autumn because Ms. Sakai decided to pursue a career as a professional singer. (The Rebels were an amateur group.) 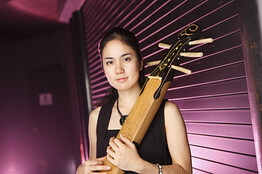 In collaboration with composer Masashi Hamauzu, she is creating a contemporary sound that includes an amplified tonkori, with lyrics in English, Japanese and Ainu. "I'm now taking an Ainu language course," she says with a smile. "It's so important that the language is revived." Like most Ainu, Ms. Sakai isn't fluent in the language (in which "Ainu" means simply "the people"). The language, which appears to have no genealogical connection with any other language family, is considered "critically endangered" -- one step up from extinct -- by Unesco, which cites a 2006 poll by the Hokkaido government that just 14 people believe they could teach it. Always spoken rather than written, the language was eventually recorded by transcribers in katakana, a Japanese syllabary, as well as Roman letters and Russian Cyrillic. The Ainu epic narratives, called Yukar, were barely saved from extinction by transcribers such as Matsu Kannari, an Ainu who served as a Christian missionary. From 1926 until her death in 1961, Ms. Kannari (who wrote as Imekanu) recorded thousands of pages of the dramatic tales. Many are about gods, ancestors and heroes, and some are more than 8,000 lines long. Miraculously, they are still recited from memory by studious Ainu like Jirota Kitahara, 33, a bear of a man with a thick Ainu-style beard. Mr. Kitahara began learning the Yukar in earnest at 18, listening to old tape recordings of Yukar performances with his parent's Ainu music group. "The Yukar are kind of like action movies," he explains. "Part of one epic I recited today is about a warrior who falls in love with a very beautiful lady he discovers among the enemy -- a kind of 'Romeo and Juliet' theme." Mr. Kitahara's performance on the large Tokyo stage was far from the homey irori -- sunken hearths -- where Ainu storytellers of old entertained their audiences. But he captivated his audience, young and old, with a vigorous, undulating delivery that reverberated throughout the hall. Following tradition, he was accompanied by an assistant who set the tempo with the beat of a stick. While the Ainu language, Yukar, storytelling and folk tales are slowly gaining interest among the Japanese, Mr. Kitahara says there's a long way to go. "My mother didn't teach me about Ainu things," says Ms. Ogasawara, who grew up in Hokkaido and now lives in Tokyo. "Ainu of her generation wanted to get rid of their heritage." Half-Japanese, she began to learn about her Ainu heritage in junior high school when writing a report on her family. Intrigued, she decided to learn more on her own. Tall with a graceful step, Ms. Ogasawara, 34, became a dancer and back-up singer with the Ainu Rebels. Now as she creates a new genre of Ainu art, she says, "There's so much I want to share. I'm still learning." Embroidery artist Shizue Ukaji, 76, knows well the struggle to learn and the joy of sharing her heritage. "When I was a child, I really wanted to draw pictures, but like most Ainu we were so poor we had no pencils or paper to draw on," she recalls. In time, as a young adult, she was able to follow her passion. Protesting for Ainu rights followed, despite objections from many fellow Ainu. Now, as an elder, she is deeply respected for her years of dedication to the cause. Drawing led Ms. Ukaji to embroidery and appliqué a decade ago. She may spend as much as a year making one of her traditional attusi robes, with appliquéd geometric patterns and intricate embroidery; they're prized for their beauty and worn for special occasions. (The traditional Ainu patterns, bold and stylized, have no representational meaning, though cuffs and hems are often embroidered with thorn-like shapes -- as Ms. Ukaji explains, to "prevent evil spirits from entering the body.") Once made of fish and animal skins and later with textiles woven from tree bark and plant fibers, the robes are now mostly cotton. One day, her embroidery led to an epiphany. "I realized, when threads are bound together, they become strong and something new," she says, pointing to a beautiful new attusi robe with geometric appliqu[eacute] not unlike an abstract painting. Inspired by her ancestors, she used a material made from woven plant fibers. "Threads like these are important for all of humanity." —Lucy Birmingham is a writer based in Tokyo.